Yes! I have a good stash report this week. I busted 2/3 yd making the binding for this quilt that has been waiting to be bound for almost two years. 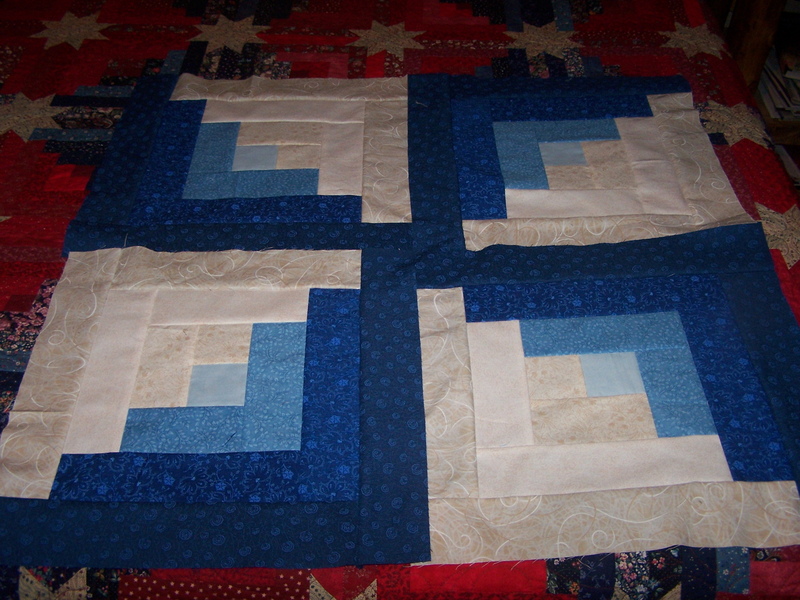 I love this quilt and it will feel so good to finish it! 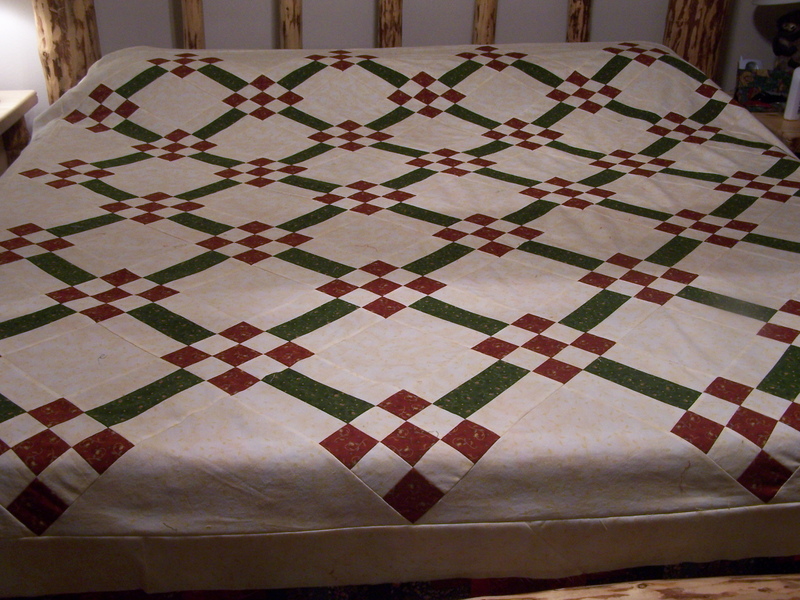 I pulled 6 yds out to make two king pillow shams for my cousin, to go with the quilt she commissioned last year. I wanted to quilt them, and I’ve never done shams before, so I might have used a little for than necessary to cut the sham tops from, but better a little extra leftover than short. I used 3 yds on top, and 3 yds of a plain cream fabric for the lining. 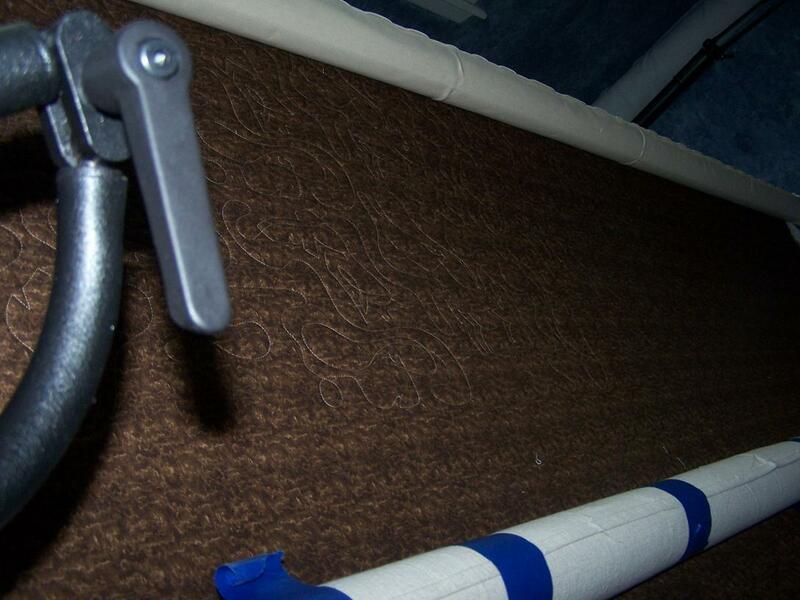 Then, when I get this quilted and ready to finish, I will use more of the top fabric for the backings. I used another yard on my light version 9P & stripe, adding the first inner border. I should have pressed it before taking the pic, but oh well. I busted the most on these log cabin blocks. The quilt will be a queen…8 &2/3 yds. so far! I think I want to use the “windmill” layout, but I will have to play with them some more before I make up my mind completely. And I’m starting to see some significant progress in my leaders/enders project from Bonnie Hunter’s site. 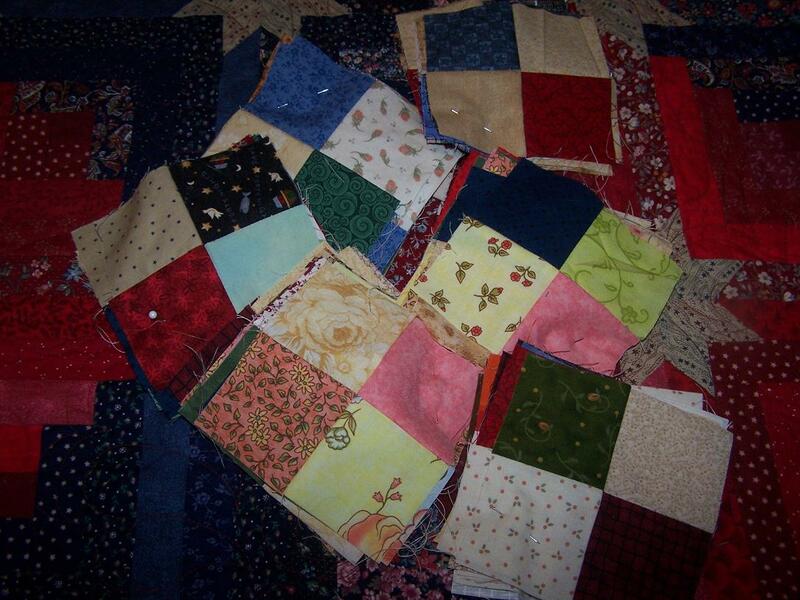 I have 60 of my 100 four patches done, for the Oklahoma Backroads quilt I am making as a surprise for my Mom. Total stash busted this week is 16 yards, if I did the math right. I need to avoid those “thirds”. So for the year, I’m still in the hole -17.75 yds. But I’m getting closer to a positive number! I haven’t even been tempted to buy any new stash! My body stash busting…not so good still. Especially not since I made that Pineapple Crack Delight that Freda posted. Thanks a lot, Freda! 🙂 Sunday weigh-in was 145. Really, really got get that going back in the right direction! Wow, you’ve gotten a lot done! Great report! Glad I could help Randi! lol You have been very busy. 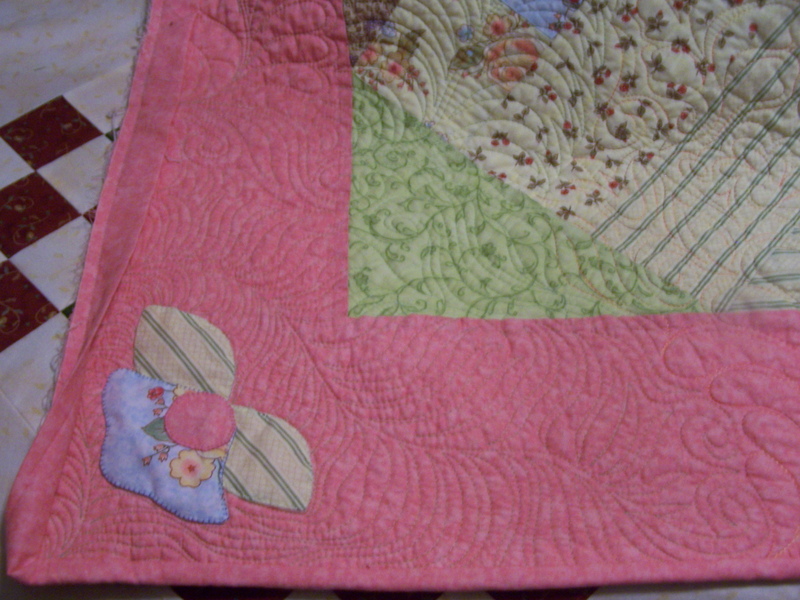 I love all the quilty stuff. You know, if you get really desparate about having too much fabric, you have my address 😉 Great job on all the quilts!!! Go Randi!!! I am so impressed! I love that setting for the log cabin blocks. I’ve never seen that before. No more recipes!! Nope nope!! (gee–I might have to buy some of those vanilla wafers, I have the rest of the ingredients!) But you’ve had a great week sewing. You’ve had a busy week! Boy I am really far behind….guess I need to get caught up! I love your windmill layout for the log cabin….You are doing a great job. Wow! You are doing great with your finishes and busting stash! Very impressive report. I really like the idea of making quilted pillow shams! I will have to keep that in mind next time I am buying border fabric.